The title says it all. 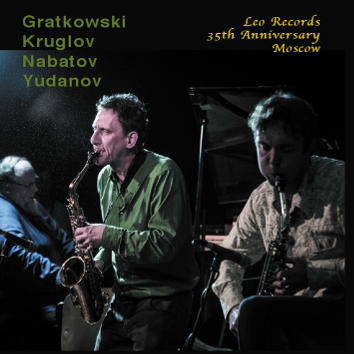 The 3rd international Leo Records Festival in Russia. DOM, The Moscow Cultural Centre, is filled to capacity. The whole intellectual Moscow is there, 400 people are buzzing with anticipation. Two Germans — Frank Gratkowski (saxophones) and Simon Nabatov (piano) and two Russians — Alexey Kruglov (saxophones) and Oleg Yudanov (drums) are going to play their first gig together. They start as four individuals but the level of musicianship is so high, the telepathic understanding of each other is so complete, the response of the audience is so great, they finish as a German-Russian free jazz quartet. This is the triumph of new music.